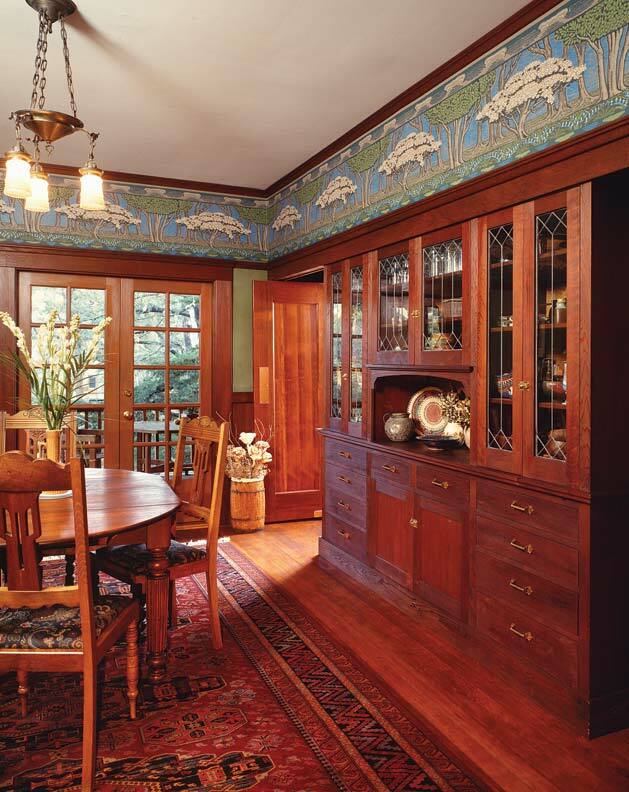 An Arts & Crafts aesthetic is strong in the dining room, with its original oak woodwork. 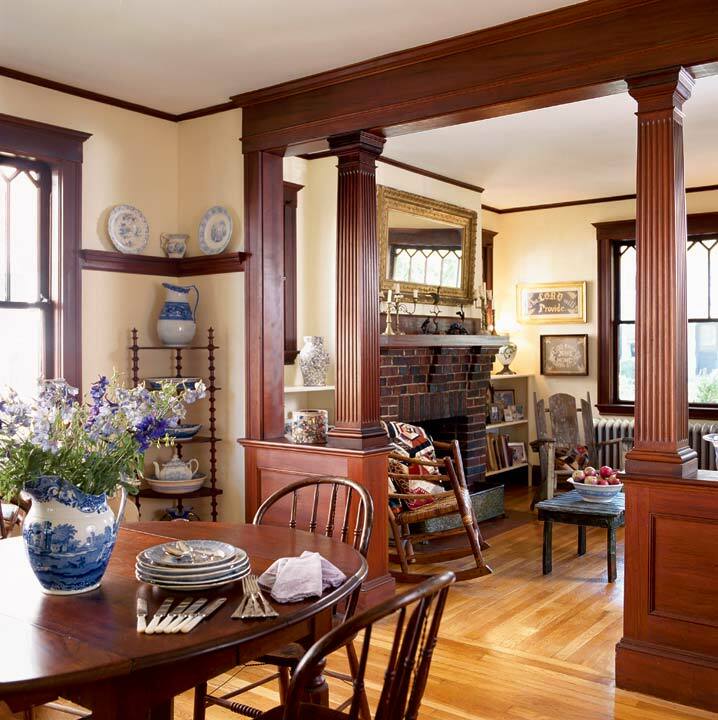 Fanciful is one way to describe this house, where Arts & Crafts-era features like oversize brackets and corbels, a chalet roof, and transomed Glasgow windows are joined by such Moresque details as the entry arch, framed window, and tile-work. 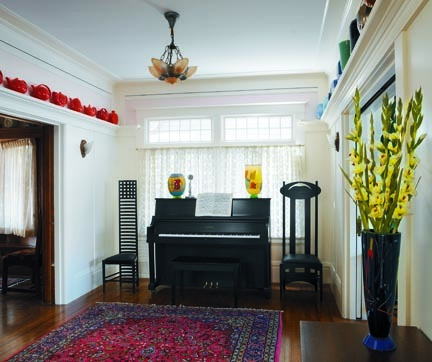 Owners Cynthia and Allen Koster have preserved the historic fabric inside and out and have furnished the house tastefully with collections from different periods. The entry hall suggests London more than the Bay Area. Black Mackintosh-designed chairs are graphic statements against the long-ago-painted trim. Collected Hall pottery on the plate rail creates a frieze. Art Deco fixtures are used throughout. Finding the appropriate lighting was a challenge. In the hall, a slipper-shade Art Deco hanging fixture is close enough to the ceiling to hide bulbs from someone on the stairs. The Kosters have collected such fixtures from as far away as Australia, and had them rebuilt to accept U.S. sockets. Color is carried upstairs, with muted hues on the walls and floors, sharply offset by bright splashes from framed prints. More of the pottery collection appears here as well. 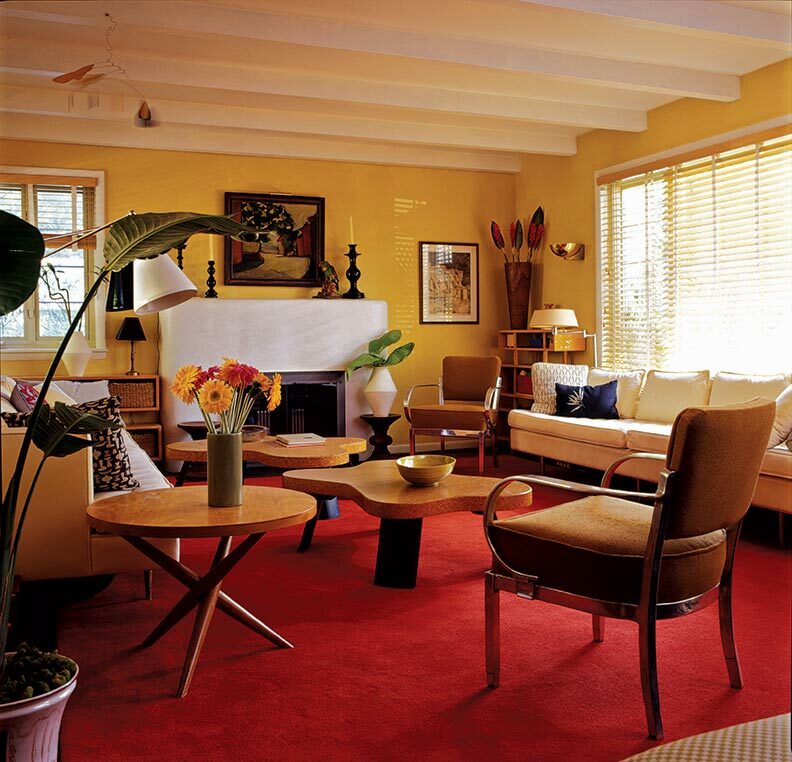 “The 1930s pottery is bright, which meant the palette overall had to be paler,” says the owner–architect. The house does not seek to re-create a moment in history. The robust and historic first floor is coherent with the more contemporary second level.